Warm weather is here finally, trees are growing, flowers are popping out, snows are gone and the days are getting longer. That’s terrific, right? Well in many ways it is, but for those with allergies, it is a time of fear and trembling. 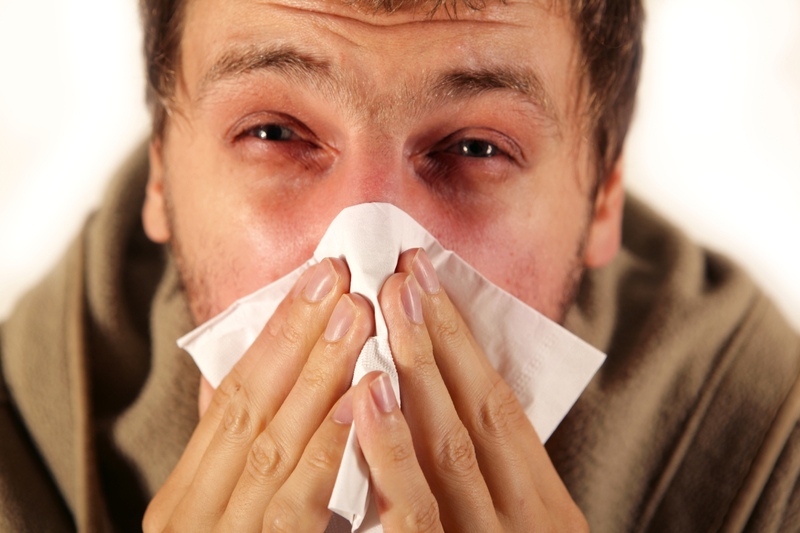 A growing number of people hear the phrase “Spring is in the air,” and the image of spending months with sneezing, coughing, runny nose, and watery eyes comes to mind. For those with allergies, this is the time of year they are more likely to be stopping to blow their nose than to stop and smell the roses. For many allergy sufferers, this time of year is a constant battle with symptoms and trying to find something that works and brings them some relief. Many people do not think about it, but allergy care from a chiropractor can be a good way to find relief. Studies have shown that allergies and chiropractic adjustments do go hand in hand and here at Tree of Life, we have had many patients come to us looking or help with their allergy symptoms. Hay fever is one of the most common types of allergy flare-ups seen this time of year. Millions of people across the country suffer from this condi­tion, which is identified by the body becoming hypersensitive to pollen, dust, and other particles in the air and in the local environment. This condi­tion causes a number of irritating symptoms that can make life miserable. Sneezing, runny nose itchy watery eyes, coughing, feeling feverish, and sinus pressure headaches are some of the most common symptoms of hay fever allergies. An allergy is a hypersensitivity reaction where your body’s immune system overreacts to outside factors and elements. Normally the body reacts to fight infections, disease, and other dangerous things but when you have allergies, relatively harmless things like pollen, dust, and other things cause severe responses in the body. In people with seasonal allergies these normal changes in environmental factors make the body think it is under attack and thus it responds in an extreme manner. Essentially, the allergic reaction that causes you so much suffering is not due to any one substance itself but by your body’s view of that substance being harmful and responding in an over-done manner. Many people try all number of things to get relief and most rely on medication to get relief during allergy season and some even need special medical intervention such as allergy shots. Allergies and chiropractic adjustments are beginning to become more mainstream and more and more people see the benefits of receiving allergy care from a chiropractor like those here at Tree of Life! No one knows for sure why allergies are such a problem for some people and not for others. One theory is that it is related to genetic codes that make the immune system more responsive to stimuli and results in over-reaction to things that a normal immune system would see as little to no threat. Another theory is that an allergic reaction to the world around you. The nervous system is the system that gets and sends information for your body so if there are issues with the nervous system then that can result in a faulty interpretation of the world around you. Whatever the cause is, the over-reaction of the body’s response to environmental factors results in the symptoms of allergies everyone knows and loathes. Do Chiropractic Adjustments Help With Allergies? Allergies and chiropractic adjustments are connected more strongly than many people realize. Chiropractic adjustments focus on keeping spine in proper alignment, and on ensuring the spine is not out of place. This helps keep the spinal cord healthy and thus keeps the nervous system in tip-top shape. The basis of allergy care from a chiropractor is to ensure the body gets and sends the right messages in response to the environmental stimuli. Think of the nervous system like powerlines that connect the brain which is the power plant. If something is wrong with the connection to the power plant it can take more power than needed to do certain things or there may be issues further down the line. When this happens to the body because of problems with the spine and spinal cord, different systems and processes of the body can become compromised. Allergies are a visible symptom of the comprised immune system responses of the body and fixing that compromised line of communication can help relieve the symptoms. Although there is not much in the way of scientific research that has been supported to show that chiropractic adjustments help improve overall health and wellness, they are definitely beneficial for many and some people see an amazing reduction of the allergy symptoms with routine chiropractic care. The reason for the inconsistency is believed to be due to fact that each person is different and the cause of the hypersensitivity and the severity of the reaction can vary so much from one person to another. Spinal adjustments can help provide some relief and it may have a greater effect for some than it will for others but it usually will at least lessen the duration and severity of the allergy flare-ups. If you suffer allergies, consider chiropractic as one of your potential powerful options. Allergies and chiropractic adjustments are just one of the treatments we offer here at Tree of Life so if you want to know more about getting allergy care from a chiropractor, give us a call and set up your first appointment with us today! september 2016 - Enjoy Your Travels... Without Back Pain!